There are plenty of people within football who will be able to relate to this story. The Football League might be the oldest organised league in world football, but the primary objectives for every single club who is a part of it hasn’t changed in the 130-year history of the competition. Score more goals than the opposition. Win more matches than everybody else. Rise up the league ladder until you reach the top, and then try to stay there. To achieve this, you need to have the best tactics and the best footballers. That means recruiting the best manager, coaches and players. To attract them you need to have the financial capability. To have the financial capability means developing a supporter base of people willing to pay to watch the team, and the business acumen to attract commercial and sponsorship revenue. And as such, the questions are the same as they always have been. How do you outscore your opponents? How do you win more matches than you lose? How do you sign the best players? How do you develop a healthy budget? What has shifted is the landscape around these questions, which is why the answers change. The fierce competition that drives football has always led to a fast pace of change. Just as someone finds a strategy that outfoxes the competition, others eventually develop ways to copy or counteract it. 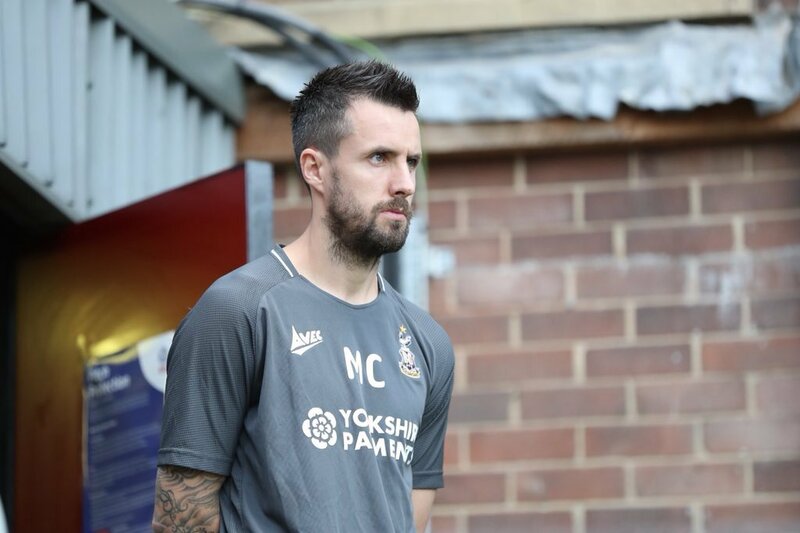 It is that drive to find new answers that leaves us to Bradford City’s strategy for the 2018/19 season. Two years on from Edin Rahic and Stefan Rupp’s purchase of the club, we go into the new campaign with the Bantams now very much in the model the joint-owners talked about from day one. There has been a huge amount of change on and off the field, and the club seems very different now to eight months ago – never mind two years. Now, we find out if all the disruption has been worth it. The answers Edin wants to put forward to take Bradford City forward include the introduction of a true head coach. A position Stuart McCall had held, but which had led to friction and argument. Rahic wants a head coach who will accept input of others, and to be part of – rather than leading – matters of recruitment. The chairman wants young players to be given an opportunity – more than McCall, and certainly Grayson, have provided over the past two seasons. He wants to win football matches of course, and for City to push for promotion. But he wants the club to grow through nurturing and selling youth. Through making wise and calculated moves in the transfer market. And through playing open and attacking football. Which brings us on to Michael Collins. The new head coach, and the youngest manager in the Football League. The recruitment process was clearly fraught, with the very specific criteria for a head coach narrowing the focus to less conventional areas. It seems ludicrous, now, that Gary Megson expressed an interest in the vacancy. The disappointment lies in the fact a number of exciting candidates, who did fit the bill, couldn’t be persuaded to take up the reins. A Ben Garner or Robbie Stockdale would have been a great prospect to have. A coach who has learned the ropes and appears ready for this type of opportunity. There can be no doubt that Collins represents a high risk. He might prove to be a very good head coach in time, but what if this opportunity has come too soon? Still playing for Halifax Town last season, and coaching City’s under 18s on a part-time basis (he wasn’t able to be present at every youth game he was overseeing due to playing commitments), his career path has been accelerated forwards a few steps. Collins talks about years of extensive study to prepare for this moment, which will no doubt stand him in good stead. But no one can say if he will or won’t be a success – the simple fact is he has not been part of this environment before. The big test of Collins will come during the season, and in handling the bumps along the way. At some point, inevitably, City will lose a home game. In the stands, opinion will be split over whether the players were unlucky or under-performed. Perhaps some in the crowd will boo the players off, or Collins for a contentious sub decision. How, in such raw and high pressure circumstances, will Collins react? What will he say to the players in the dressing room to get them to respond in the right way? How will he handle having to speak to the local press within minutes? And in dealing with a chairman who might have some tough questions? Collins has never been in this type of position before, or worked directly alongside anyone who has. Yet these are the moments that often define a manager. The comparison has been made between Collins and Paul Jewell, Chris Kamara and Terry Dolan. City bosses of the recent past, who had never been a manager before, but who were very successful. But all these people spent time as assistant manager, learning about the role by working with someone else. Paul Jewell, for example, already knew the dressing room – and how to handle Geoffrey Richmond. Ben Garner has spent the past year working closely with Tony Pulis as assistant head coach. Robbie Stockdale was first team coach under Sam Allardyce and then Chris Coleman. Both have been in the midst of the cauldron of football management pressures. Collins, in comparison, simply hasn’t. Not that Collins is the only rookie boss in this situation. The 2018/19 season will see the football manager debuts of Joey Barton at Fleetwood, Frank Lampard at Derby County and Steven Gerrard at Rangers. None of this trio have more coaching experience than Collins, and will face the same alien challenges. But that leads us on to a second, important point that might count against Collins – his stature. As a player, Collins spent the vast majority of his career playing in Leagues One and Two, save for one season in the Championship. His achievements are completely dwarfed by Barton, Lampard and Gerrard. This has absolutely no bearing on Collins’ head coach ability – as the old adage goes, great players do not make great managers – but it does affect how they are perceived. Fans of Fleetwood, Derby and Rangers will look up to their new managers. At City – as wholly unfair as it is to say – we will look down on ours. What it means is Collins won’t get much of a honeymoon period with fans. We’ll need to be convinced that he is capable of doing the job, quickly, as it will be all too easy to dismiss him as out of his depth. Some supporters have already written him off and are waiting to see failure confirmed. Compare how you would be feeling now if Craig Bellamy had been given the head coach nod. Coaching experience-wise, very similar (although Collins hasn’t been coaching young players for as long), but how Bellamy would have been accepted is very different. I write this knowing full well it is completely unfair on Collins, and wrong he should be treated in that way. But the harsh reality is that is what’s going to happen. Football management, including head coaching, is a brutal profession. It was similar when Paul Jewell got the job all those years ago. A lower league clogger, whose long service playing for Bradford City was hardly sparkling with distinction. Fans looked down on him at the time, with many failing to renew their season tickets. Jewell had to convince his public that he was the right man for the job. And that is what Collins must now do. The final angle of doubts Collins must overcome is the conspiracy theory he is a puppet for Rahic. A head coach avatar for the chairman, to allow him to ultimately call the shots. Jewell was accused of it when Geoffrey Richmond gave him the job, and had to prove he wasn’t. Collins will need to do the same. Mistakes are inevitable, but how quickly Collins adapts to the job and the way he leads during the ups and downs of the season will determine his fate. Rahic has a duty to really support his man. He has stuck his neck on the line by giving Collins the job – and if it doesn’t work it will be the chairman, rather than head coach, who receives the brunt of the criticism. If Rahic wants Collins to play young players, he must allow his head coach to do so without fear of the inevitable mixed results. Greg Abbott, too, is also vital. He at least has experience of management. Collins will really need his help and advice. It will be a masterstroke if Collins works out. It is certainly a different answer to the old question, and one that might make sense. Ultimately, City need to have a head coach who can work with Rahic. McCall couldn’t. And though Grayson displayed no signs of antagonistic relations with the chairman, he ultimately chose to step away from working for him. Rahic could have gone for another tried and tested manager and fans would have had an easier time accepting the choice. But if doing so just leads to the same outcome of strained chairman/manager relations, it probably wasn’t the right move. At least Collins knows Rahic. And Rahic knows Collins. There should be no surprises. No false expectations. The squad available to Collins looks stronger – much stronger – than last season. The transfer committee wasn’t on the back foot like it was last time, where it struggled and ultimately failed to recover from losing the services of key players. Even with the players they did recruit a year ago, there appeared to be obvious flaws in the records of Dominic Poleon, Paul Taylor and Shay McCartan. That when the chips were down, their past history didn’t suggest they would stand strong. And so it proved. There are some clever, eye-catching bits of business to City’s summer recruitment. Several incomings have been of the calibre to make other clubs sit up and take note. In midfield especially, City look very well stocked. Up front, there remain some question marks – especially if Charlie Wyke is sold. But on paper the squad looks like top six material. It’s all down to the coaching and bringing it together. And of course, the big challenge across the board is uniting this disunited football club. 2018 has been a rotten year for the Bantams, and it has taken its toll. City will play in front of lower crowds due to thousands not renewing. Others are still here, but sceptical about the direction of the club. It’s been a civil war at times between supporters. If that continues, the club is unlikely to succeed. It is in no one’s interests to fail. Not any single Bradford City supporter. Not Rahic. Not Rupp. Not Collins. Not Abbott. Not Martin Drury. Not the players. Some fans are disillusioned and expecting failure – how great would it be to be proven wrong? Because if the negativity proves to be misplaced, that means the club is successful. Which is what we all want. If Edin Rahic is parading around Wembley stadium in 10 months’ time, having helped to mastermind City’s promotion to the Championship, each and every one of us who questioned him will be celebrating alongside him. That doesn’t mean it is wrong to apply a critical eye to the decisions of the last few months, or to be fearful – right now – about the future. Make no mistake, Rahic has a lot to prove. This is a defining season for Bradford City, where you have to hope all the turbulence of the last few months is shown to be worth it. That the answers Rahic has come up with to the age-old questions prove to be the right ones. Because if it goes wrong here, it could be very difficult to recover. Rahic’s belief is that – by doing things differently to everyone else in the division – City can have a competitive advantage. That by merely replicating what Sunderland and other clubs with larger budgets do, you will always finish behind them. Has he got this approach right? And have others have got it wrong? As always, some very good points which I agree with. Two matters stand out for me. Firstly, I am disillusioned about our football club. You use the word in your article and that is exactly how I feel right now. In the 30 seasons of supporting this great club, I’ve felt so pessimistic about a forthcoming season. Saying that, I have renewed my season ticket and hope that the team of new players along with Robinson and co play for Collins and their shirt. Secondly, I don’t believe that on paper we are a top six team this season. For me, success will be avoiding relegation. Usually I am a glass half full person. Unfortunately at the moment, I am a glass half empty person regarding Bradford City. I think that there are major issues at Valley Parade and this is shown in the fact that Collins wasn’t first, second or even third choice for the now so-called head coach position. I hope that I am proved wrong and in May 2019, we are talking about a good season. Success for me is Collins still being head coach at Bradford City at the start of the 2019/2020 season. I also do not expect a top six finish. Success for me would be avoiding relegation and although some of the signings look good potentially only the passage of time will prove that they are or not the kind of players to take us forward. We will not know what we have until Xmas in the same way we didn’t know what we had last season in McCartan, Poleon etc. Added to retention of our League One status I would like to see Rahic in particular start to show signs of respect to for the clubs heritage. I hear rumblings about a redesign of the club badge! If this is true then it’s another sign of continued change which may further add to the division between some supporters and the owners. Certainly some fans have already voted with their feet and their are several theories about why they have chosen not to renew their season tickets. Whilst it is true that some are relatively new to the rollercoaster life of being a City fan and have jumped off at the first hiccuping, I know for certain that many are long term City supporters. This concerns me but apparently not the club. Others, myself included have renewed, but somewhat reluctantly. I will be going to some games but feel a massive disconnect between the supporters and the club. In short I don’t feel part of it like I did with SM and PP in charge. Or even with ML and JR running the club, with their obvious shortcomings mainly of a financial nature. But in essence R &R should be very concerned about not only losing several thousand regular supporters but also the nature of the reasons for them not buying into their vision. At the very least it represents a shortfall in revenue. Put more simply and speaking with 52 seasons of observation, winning back these lost supporters will be a very difficult thing to do. People will quite simply find other things to do on a Saturday and get out of the ‘habit’ of attending Valley Parade. So success to me this season will be the reparation of some of the reasons for this disconnect between the club and fans. If we do have a bad season and even more fans decided that next season is not for them, then the knock on effect could be serious for the club. To give Edin credit – he does seem to have really gone for it with the implementation of his model. Collins is clearly his appointment and he has backed him with what seems to be a very decent squad. This has to be a good thing for the club – the 2018 debacle of chairman, manager and fans all pulling in different directions could not be allowed to continue. That would never have led to success. Now we a clear strategy which has been backed from the top, a coach who has signed up to the strategy and a team which has been signed to deliver on it. All the new faces into the club, coupled with the departures of Vincelot, McMahon etc do make this feel like a fresh start, at least on the pitch. Three weeks ago I had us down as certainties for relegation. Now, with the signings of Payne, Scannell, Seedorf, Mellor etc, I’m more optimistic. They’re good players and on paper we look like a good team. We do need another striker but assuming everyone is fit, playing 4-2-3-1 with Scannell, Payne and Seedorf/Robinson behind Wyke looks like an imposing front four and I’m expecting goals from all of them. Under a good manager I’d be expecting top six. We’ve got no idea whether Collins will be a good manager – sorry, head coach – or not, we’ll just have to wait and see and give him and the players a chance. I said in February that, with the transfer window shut, the time to judge Rahic would be in the summer. At least in terms of players it looks like he has learned his lesson somewhat. We’ve signed players with proven quality having played in higher leagues. Stuart McCall is probably looking at this new squad with envy compared to what he was given to work with last season. Depth of squad is still a worry, as is the question of whether Wyke will stay or go. The result against Harrogate also suggests that the development squad is not up to scratch – I’d worry about any of them coming into the first team to cover for injuries and suspensions. For the club to be successful on the pitch it is going to help if there is stability behind the scenes. Clearly last season there was not, Rahic sets the tone and direction the club is headed in, so we’ll see whether he’s also learned lessons here too. The ridiculous saga of trying to hire a head coach coupled with the departure of James Mason suggests perhaps not. Let’s hope he allows Michael Collins, Greg Abbott and the team to just get on with it this season. It’s got the makings of being one of the most interesting seasons of recent years, at least, with so many unknowns to factor in. And it certainly can’t get worse than last season – can it? Collins and Drury have been thrown in the deep end by Rahic. Time to see if they can swim, and if they do start to sink whether Edin will throw them a life bhoy. another great article. Thanks. Interesting season ahead with some good players signed including Doyle. To me as well as the disconnect between club and fans we also need to arrest the abject performances of the last 12 months especially at home. I renewed our ST’s despite being bored rigid by the football last year. We lost far too often at home to poor teams. My u11 sons are bored too and missed much of last season. They are the future and we need to get them back on board. Let’s hope we get a good start! As ever, insightful, well written and exactly what I think. You are PREDICTABLY and CONSISTENTLY good at writing this stuff. I’m desperately hoping Michael Collins works out, and I’m willing to give him time. I’m in the same boat as Dave above in that I take 3 boys, and they are more ruthless than me. If we don’t see goals and basically score more of them than the other team, I’ll be on my own by Xmas. I shook hands with Greg Abbott, Michael Collins & Edin Rahic on Sunday and wished all of them good luck for the coming seasn. I think they’re going to need a good dose of it. I can give background to why I have not renewed. I will go, but rarely. The largest part is personal and would be little changed by Rahic’s actions. I also have other things to do, and money is tight. £169 is still a bargain, but but a waste of money if I don’t want to watch. As I get older I am starting to dislike football. I don’t care who wins the premiership, or anything else. My enjoyment of City has been draining away. Wishing I was somewhere else with each passing game. Yes, there have been some great moments, but I walked away from the last Wembley trip utterly resigned to the result. The thing that most talk about is ‘belonging’. I have no illusions. Bradford City is a business not a community. And that brings me to the City issues behind me not renewing. I understood that a new board would want to sack people and employ new to change things; but I would expect there to be improvements soon after. So far we have not had any. We are now at Year Zero, and the new Khamar City state has nobody I identify with. City’s efforts to get me to renew have been appallingly bad. I get better notifications from the Grimethorpe Band than I get from BCAFA, and I’ve only seen that band twice! Which suggests the staff letting has resulted in failure, so far. The early deadline for season ticket renewals last year made me angry; but the possibility of at least a play-off made me commit. Rahic tried the same trick this year; and by the time he had realised he’d screwed, it was too late. Last season was oversold very well by Mason, largely on a promise; but the poor recruitment made the promise look false even before the first ball was kicked; McCall’s miracle of getting a team of mis-fits into contention for half a season papered over the obviously failings in the team, but when it started falling apart Rahic was a clear and present reason. So I now plan to go to any home cup games against lower league opponents, because it’ll be empty and I’ll be able to drink whisky in the main stand and watch the match on the monitors. I’ll go to some league games, if finances allow, and if City do well enough, I will think about getting a season ticket next year. In the meantime I hope you all enjoy watching a team that proves me wrong and Rahic right. I too find myself being disillusioned not just with City but with the game itself. As far as City are concerned the widening gap between the club and it’s fans is my biggest concern. The fact that Edin and Stefan don’t seem to realise it exists or more crucially appear to care is extremely worrying. Edin famously said that anybody that does not buy into their methods knows where the door is represented the attitude and arrogance of these people. It this season goes badly then we can expect a fall in season ticket sales to compound those of this summer. Those season ticket holders will be hard to win back. So far the smoke and mirrors of 15 new signings has not only masked the real intent of getting rid of any player, or staff who represent the past, but also convinced some fans that we are moving in the right direction. As we know new players flatter to decide and we will only know what have signed after 15 to 20 games. Think Poleon and McCartan at the start of last season. A view shared by me and, judging by lost season ticket sales, several thousand others, Mark! there was never a doubt in my mind about renewing my season ticket. that said I have never been more despondent about an upcoming season except in seasons immediately following relegation. let me be blunt, i do not buy in to the rahic management model where the chief coach can be overruled by the other members of the committee, clubs have had success with backroom recruitment teams but only where the manager retained the final say. I don’t recall a successful club where the manager/head coach could be overruled by his colleagues. as to the new squad, the signings all look good but for me the old shortcomings remain. in short I see us yet again struggling to score enough goals. the late sir bobby robson once said that if your team had two front men, one who scored you one in two and one who scored one in three, then you were well on the way to having a successful side. goals from other areas of the team should supplement those from the front men not as an alternative to strikers’ lack of goals. we still have only one worthwhile target man on our books. this despite greg abbott’s assertion to fans last autumn (after the debacle of the fleetwood game, when we put out a side lacking a target man) that we needed another worthwhile target man to provide competetion for wyke when he was available and cover for when he was not. we were told that targets (plural) had been identified and that this second target man would be arriving in the january transfer window…..he didn’t. City will once again suffer if and when our sole target man is un available in the coming campaign. finally, can i say that there will be no one happier than me if my misgivings turn out to be wrong and we have a really successful season.